The Toolcat™ utility work machine operator training course imparts rules and practices for safe operation. It is NOT designed to license or certify operators as skilled or factory authorized operators. View an excerpt of the Toolcat™ utility work machine operator training course handbook. Get a preview of the video content in the Toolcat™ utility work machine training course. Discuss the features and important characteristics of the Toolcat utility work machine. Explain loader rated operating capacity (ROC), maximum cargo box load, maximum tow weight, maximum trailer hitch tongue weight, machine rated capacity and total rated capacity. Explain important issues of hauling loads in the cargo box or on the lift arm. Explain important issues of towing equipment with the work machine. Explain the importance of using the seat belt and shoulder belt for operator and passenger restraint. Identify the machine's safety features and explain their importance. Know the fundamentals of safe and efficient maneuvering, traveling, and working with the attachment, cargo box, and trailer. 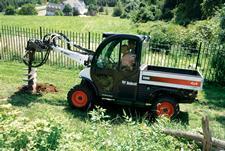 The Toolcat™ utility work machine, developed by Bobcat Company, is a machine that is designed for property maintenance, commercial groundskeeping and landscaping. It has a lift arm for handling loads, a cargo box for hauling loads and a receiver hitch is available for towing loads. The All-Wheel Steer feature makes the utility work machine able to work on different ground conditions, including mud and snow, while being able to operate on work surfaces like turf and grass with minimal ground disturbance. Not only will it take you and a co-worker to the jobsite, it will also complete the job like no other machine can. Unlike an All Terrain Vehicle (ATV), golf cart and a pickup truck, a Toolcat utility work machine has a lift arm that is used to raise and lower heavy loads. Carrying a load outside of the machine's wheelbase alters the machine's handling characteristics affecting stability, steering and braking that is different than other types of utility vehicles. Slow down when you make a turn. Do not make sharp turns when you are carrying a load. Do not overload (see Machine Load Capacities decal). Handling characteristics are different from an ATV, golf cart or pickup truck. The machine is capable of low and high range speeds. Make sure you wear the shoulder belt for additional restraint at high range speeds.